First things first. Apologies for a break in posting - I've had exams and was surviving on a strict diet of chips, coffee and brownies. Now, though, the school year is over and I have 4 months of holidays ahead of me. 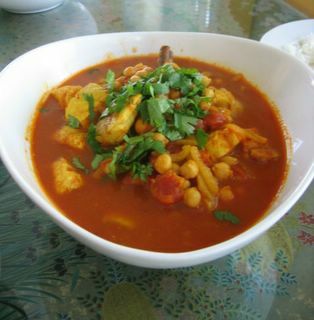 For dinner last night, we had Jamie Oliver's Scrumptious Spanish Chickpea and Chorizo soup, from Jamie's Dinners, followed by Bill Granger's Moroccan fish stew, from Every Day. Incidentally, Every Day is Bill's latest book, which has all the recipes from his current TV series. I picked it up on the weekend, and it is wonderful. There are so many really delicious-looking recipes in there. The TV series is showing on Lifestyle Food, so check it out if you can. Now, back to Jamie's soup. He says himself that it's not a very pretty dish, but the flavours are amazing. You start by frying off some chorizo, then add onion, garlic and celery, and let it stew for 15 minutes. At this point you add a big bunch of chopped spinach leaves, tomatoes, chickpeas and chicken stock. It needs to simmer for 40 minutes. 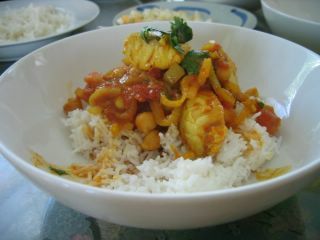 While the soup was having its 40 minutes simmering, I made the Moroccan fish stew. (I realise that the flavours of both dishes don't exactly compliment each other, but I really wanted to try both of them). As you'd expect with a Bill recipe, it's very simple and quick. In fact, it only took about 30 minutes in total to make. It's just a case of frying off some onions with various spices and ginger, adding a tin of tomatoes and some water, and cooking small chunks of fish in the liquid. At the end, you add a tin of chickpeas and a couple of teaspoons of honey. We ate the soup first. Before serving, you add some finely chopped prosciutto, a slug of olive oil, and garnish with grated hard-boiled egg. (Sounds weird, but just go with it. It's really good). The soup was amazing!! It was so rich and deeply flavoured. We were amazed that something that only took an hour to cook could taste like this. It reminded me of the fabulous caldo verde soup that I tried in Portugal. I would definitely make it again. The stew was also lovely, but had a much milder taste. (In fact, my mum found it a bit bland after the soup). 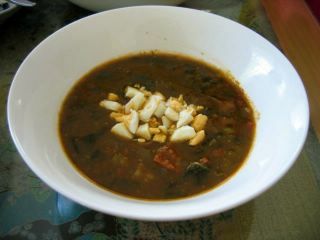 Served with some basmati rice (done in the rice cooker, of course), it makes a delicious, light and nourishing dinner. I can't wait to try more of the recipes from Every Day! After watching an episode of the show with me, my dad has already requested the lemon chicken and the peanut butter chocolate chunk cookies. I love that soup, thanks for reminding me I must make it again ASAP! Glad you survived the exams! Both dishes look lovely Sarah, as do the cookies. I have Bill's latest book too, must make something from it soon! I absolutely love chorizo. It is one of my many guilty pleasures. I shall need that recipe.